The laws of Newton and Maxwell that govern our macroscopic world do not accurately predict the behavior of atoms, electrons, and photons. At the scale of these particles, the rules of quantum mechanics reign, allowing a single particle to exist in multiple "states" at the same time (a superposition), and even calling into question the link between cause and effect. For more background, read the Physics Buzz from Monday, Standing at the Wavefront of Scientific Discovery. Experimentally probing the quantum world was once thought unattainable. If a particle interacts with its outside environment, its quantum states are instantaneously determined and their quantum properties of superposition vanish. Haroche, Wineland, and their colleagues have leaped over this quantum boundary by developing methods of trapping and observing single atoms and photons as they traverse the boundary between the quantum and classical world. To detect a photon is to absorb it; but in the quantum realm this absorption destroys the quantum properties of superposition as the photon slams into a discrete state upon measurement. In Haroche's lab, a tightly sealed box lined with superconducting mirrors is so reflective that a single photon can bounce back and forth for a tenth of a second without being absorbed. 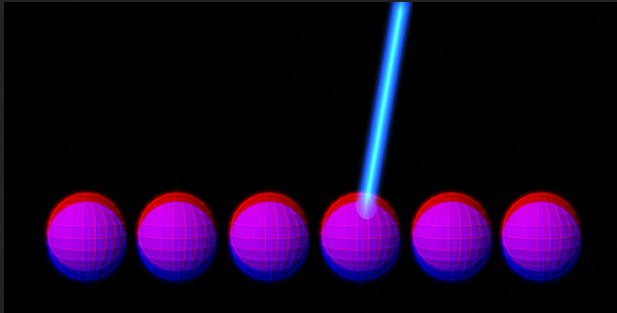 In what seems like a blink of an eye, scientists can study the evolution of quantum effects and learn more about how the world of single particles composes our own. Serge Haroche (right) in his laboratory. "For a very long time, people were working with huge collections of atoms and photons," said Haroche this morning in a phone interview with the Nobel Prize website, "when you work with such big samples, quantum properties are, so to speak, veiled. They are hidden because of statistical effects. If you work with small particles as we do, then you can reveal the quantum effects in a very dramatic way and you can learn about these quantum processes. That is what we are trying to do." Haroche's lab studies the evolution of a photon's quantum state by sending in an enormous atom, called a Rydberg atom, that will not absorb the photon in the box. While the Rydberg atom doesn't absorb the photon, the presence of the photon leaves a measurable affect on the phase of the Rydberg atom. 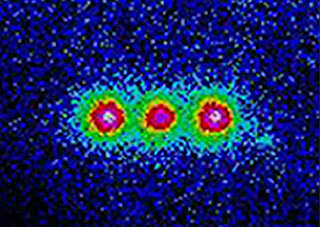 The scientists then measure this phase change in the Rydberg atom and uncover the photon's quantum state, without affecting the photon and thus without losing the photon's superposition. More recently, Haroche and his colleagues have used a stream of Rydberg atoms to collect information on the quantum state of the photon as it transitions from the previously inaccessible quantum superposition of states to the well-defined state of a classical mixture. While Haroche saw photons as the rabbit hole to the quantum world, Wineland chose a much larger particle to keep track of-- the ion. At the heart of Wineland's experiments is the atom trap. Surrounding an ion with a powerful electric field and insulating it from the outside world with a strong vacuum, the single ion can be cooled to its lowest energy level, from which the scientists can study the quantum world. Then, using finely adjusted lasers in very short pulses, the ion can be jiggled into a superposition of quantum states. 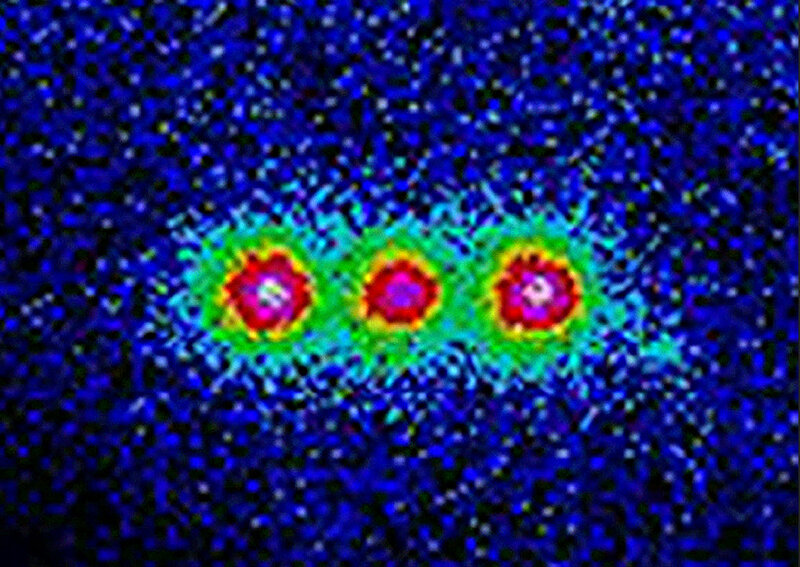 Three beryllium ions in an atomic trap. On the scale of quantum particles, a whole ion is a huge object to keep in a state of superposition. In successfully toeing the line between the quantum and classical realms, Wineland and his colleagues have also advanced the applications of the quantum world to quantum computing and to the high precision measurements that probe questions raised a century ago by Einstein's theory of relativity. By increasing the precision with which we measure the passage of time, Wineland's work with optical clocks has enabled scientists to measure relationships between space, time, and motion. For objects moving at high speeds or experiencing a very strong gravitational force, time will move more slowly. 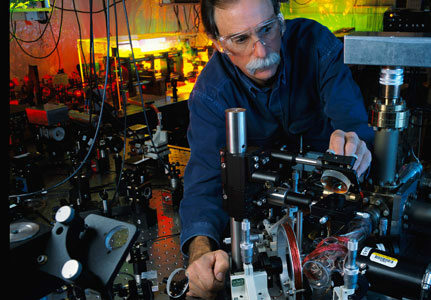 Since Wineland's development of the tools to probe quantum atomic states, scientists have used the precise counting of an optical clock to show the difference in gravity when the clock's height is changed by 30 centimeters and demonstrate the slowing of time when the clock's motion is altered by less than the speed of a bicycle. In computing, a "bit" is reported as either 0 or 1, and the series of bits that compose binary can communicate and store information. If scientists can maintain a particle in a superposition (which they can), a "quantum bit," or qubit, can be both 0 and 1 simultaneously. If scientists can devise a way of maintaining this kind of quantum superposition in a computer, the quantum computer would be able to store and process information exponentially faster than current computers. The future of quantum computers aside, what this year's Nobel Prize recognizes is that our understanding of the quantum world would not be where it is today without the work of Haroche, Wineland, and their colleagues. That, after all, is part of the beauty of the Nobels: an annual reminder to learn about the discoveries that have led us to where we are today. To learn more, read about the Nobel Prizes or watch the Nobel Laureate lectures-- they're a real treat. Work thoroughly deserving of the Nobel Prize for Physics.